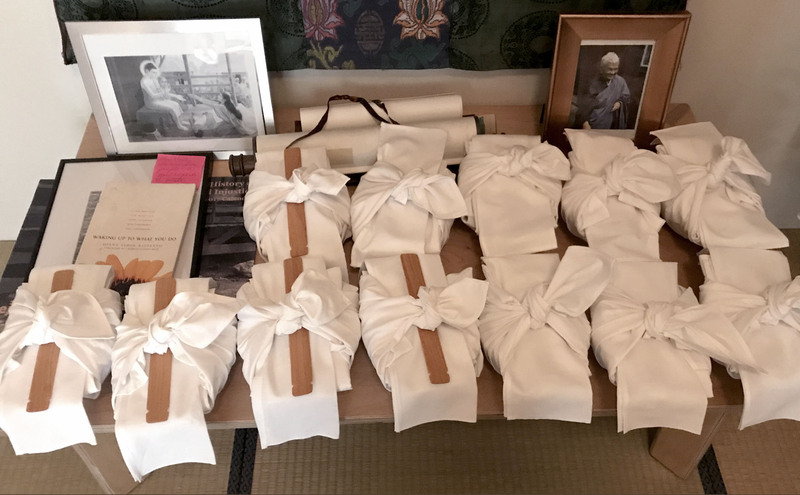 In June 2018, Brooklyn Zen Center practiced the ceremony of oryoki for the first time in the sesshin that was led by Tenshin Reb Anderson Roshi. 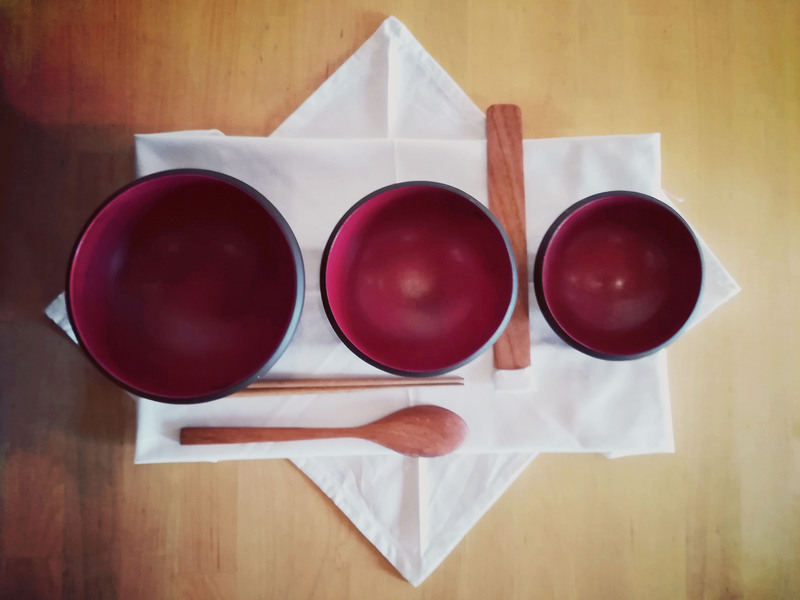 The word oryoki refers to the bowls that are used for the meal—three nested bowls accompanied by eating utensils, a lap cloth, and a wiping cloth, all wrapped up together in a white cotton cloth which also serves as a place mat. During oryoki, participants eat their meal in seated meditation posture, receiving in their bowls the food that is offered by servers, bowing and chanting together in gratitude. When the sangha has finished eating, they clean, re-assemble and re-wrap the bowls at their seats. Bringing the ceremony of oryoki to Brooklyn Zen Center involved and required the participation and effort of many of our members. We began in February to gather the equipment that would support two oryoki meals each day of the five-day sesshin. Forty-five carved mango wood bowls and utensil sets, made in Indonesia, were ordered. Several bolts of white cotton were measured and cut into cloths for the forty-five sets, and then all were hemmed. 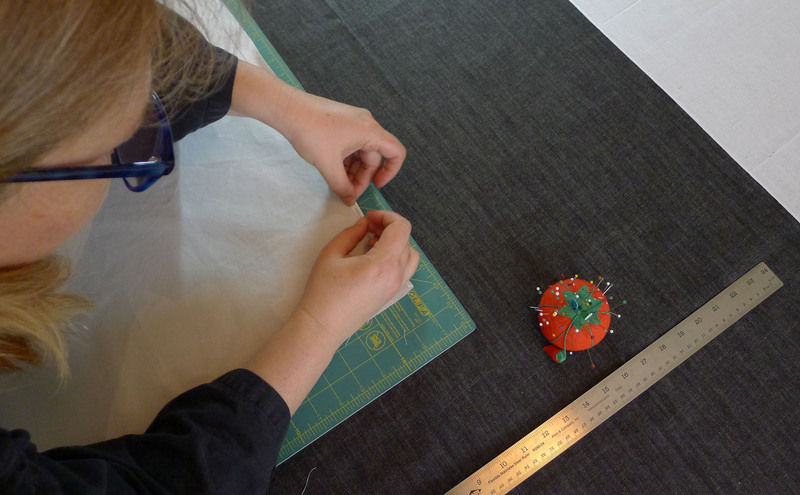 Utensil containers were hand sewn. Setsu’s (the utensil that cleans the bowls) were notched and cotton tips were made for each one. Serving pots, ladles, spoons and tongs were purchased, as well as small dishes, spoons and serving trays for offering gomasio (a Japanese condiment made of ground toasted sesame seeds and salt). We bought teapots to carry the hot water to wash the bowls, and containers to receive the used water. And for those who sit meditation in chairs, folding tables were purchased. 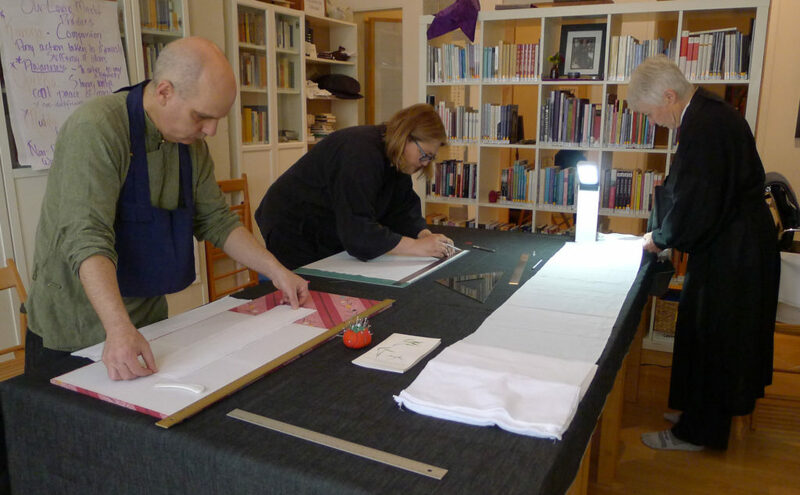 When the equipment was gathered, trainings began. Each person in the sesshin was offered instruction in the detailed movements of the ceremony of eating oryoki, learning how to open and set out the bowls, arrange the utensils, receive the food silently with hand signals, clean the bowls and utensils, and re-wrap everything at the end of the meal. Twelve participants in the sesshin were trained as servers, learning the movement patterns and serving techniques of the oryoki tradition. Later the servers learned and practiced the “servers’ meal”, instructed by the soku—the head of the serving crew. 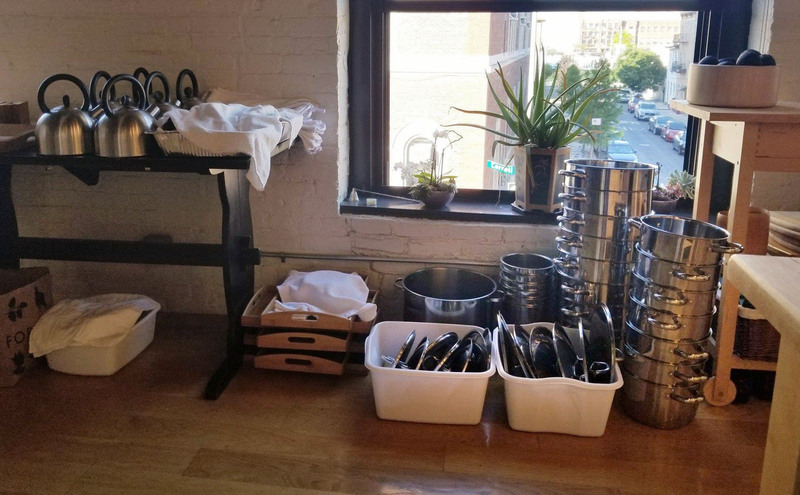 The kitchen, led by the Tenzo (Head of Kitchen), learned the forms of practice used to prepare the food served, and the ceremony of offering the food to the serving crew, who then brings the food to the sangha in the zendo. On the first day of sesshin, 80 per cent of the participants, including the servers, had never seen the ceremony of oryoki. Tenshin Roshi said afterwards that he was amazed by the creative and unusual ways the participants initially found to organize and wrap their bowls. 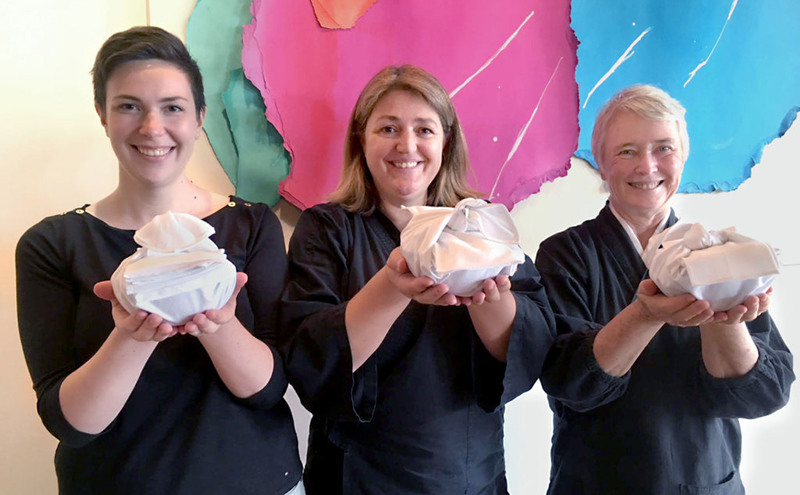 By the fifth day, to my eye, the participants seemed to be smooth and harmonious with their bowls, utensils and cloths, and the servers were looking like the trained crews I have practiced with at Green Gulch Farm and Tassajara Zen Mountain monastery. Most importantly, in practicing the ceremony of oryoki, the continuity of meditation was maintained throughout the day. Meals were not a break, but a deepening and sharing of zazen. The kitchen participants were connected to the zendo through these forms, and everyone together could realize the “emptiness of the three wheels—giver, receiver and gift”. 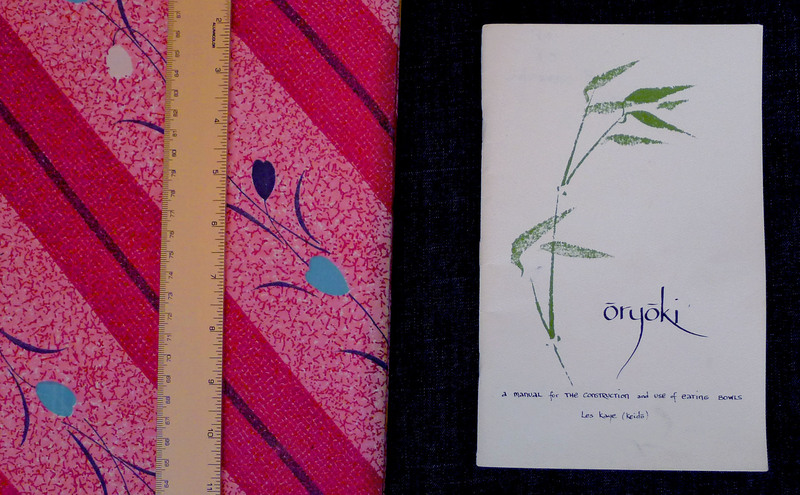 Held this way, oryoki unfolded at BZC as a deep form of practice, made possible by the enormous effort of the sangha. We will be continuing this beautiful ceremony in our fall sesshins and zazenkai (daylong retreats, with oryoki). 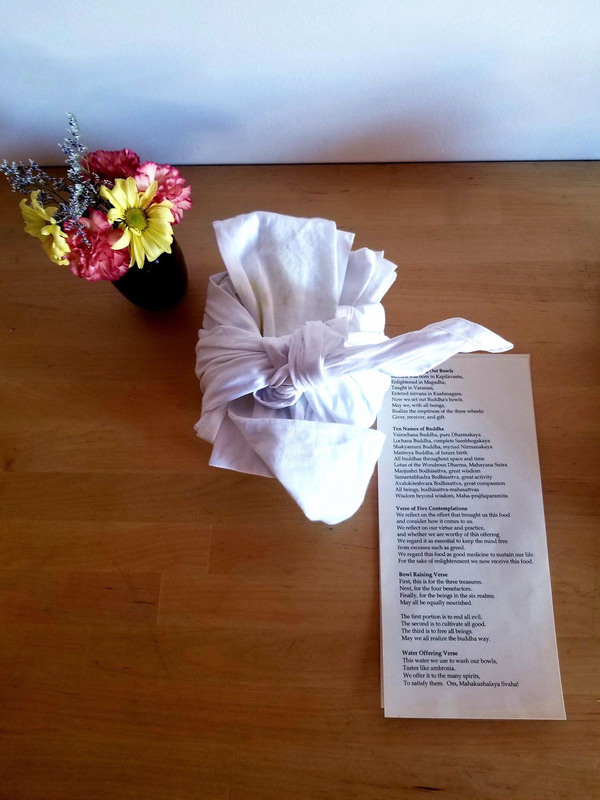 To Greg Snyder and Laura O’Loughlin, our guiding teachers: thank you for the invitation to bring this ceremony to the Brooklyn Zen Center sangha, for your encouragement and advice throughout the process, and for your faith in the process, the sangha and in me. To Ian Case, partner and consultant throughout the process, who held 10 oryoki trainings in one week: great thanks to you! To our administration team — Danielle Saint Louis, Molicia Crichton and Dulce Fernandes — for your organizational support and letting the community know about our endeavor: deep bows! To Ella Antell and Maya Petrovic, who organized and led the sewing effort from the beginning, with ingenuity, creativity and enormous skill, producing oryoki cloths for 45 oryoki bowl sets, and pot “diapers”, setsu tips, and tea pot cloths as well: our great gratitude to you for this huge effort. To Joanne Miscall (our Tenzo’s mom): thank you so much for sewing so beautifully many, many oryoki cloths long distance (all the way from Albuquerque, New Mexico). To Radha Radkar’s mom, Mrs. Vidya Radkar: we are so very grateful for your super generous donation of a sewing machine (brand new) to Brooklyn Zen Center, which made our completion of the sewing on time possible and will allow us to continue to make cloths. To Don Rider: thank you for the use of your sewing machine and for your excellent sewing as well. To Kiku Morimoto, Layne Negrin, Carol Eilenberg, Liz Chidder, Brenda Biddle, Flo Lunn, Kyle Arnold, Alice Pencavel, Jennilie Brewer, Michael Smolinsky, Ian Case, Camille G and Lauren: what an amazing, dedicated and fun group! Thank you for your wholehearted (and then some) sewing effort! To Dexter Ciprian and Layne Negrin who notched the setsu’s: we are truly grateful for those notches and for your contribution! To Andy Ring (Flo Lunn’s husband) who made meal board towel boards, cut and sanded out of beautiful wood: thank you so much! To our Tenzo, Kristin Miscall, who took a great leap of faith, planning and preparing meals in a new way, practicing flexibility and patience with each new surprise, saying yes over and over: arigato gozaimashta! To our Fukutens, Alex Gekas and Gayle Salamon, for your leadership and effort in the kitchen and for helping to gather the serving equipment: deep bows! To the Ino’s, Kristen Davis and Yoko Ohashi, who welcomed this ceremony on top of a long list of ceremonies to produce and care for, as well as for joining the serving crews and for being doan for the oryoki meals: thank you. To Laura, for offering your beautiful voice to lead the chanting during oryoki. To Greg and Laura, for helping me guide and instruct the “diners” during the oryoki meal. To all of the Soku’s, Ino’s, Tanto’s and oryoki instructors of San Francisco Zen Center, who established the ceremony of oryoki at Tassajara, City Center and Green Gulch more than 50 years ago and who have taught this ceremony over the past five decades to thousands of Zen students, and to whom I am grateful for having learned this beautiful practice: nine bows!!! To Tenshin Reb Anderson, who said YES when I asked him if he would welcome oryoki in his sesshin at Brooklyn Zen Center, knowing full well that most people would not have seen or practiced the ceremony up to that time. Thank you for your faith in us and for your openness to the unpredictable nature of our undertaking and all Reality. To the Sangha of Brooklyn Zen Center who met this new ceremony with enthusiasm — from servers who said yes to serving without ever having seen or practiced oryoki, to all those who came to oryoki and server trainings, to the participants in the June 2018 Sesshin, whose dedicated, concentrated and somewhat innovative effort in practicing oryoki was a true delight to witness: we wholeheartedly offer thanks. May we all continue together in the practice of this beautiful ceremony! *Translated by Shohaku Okumura Roshi. 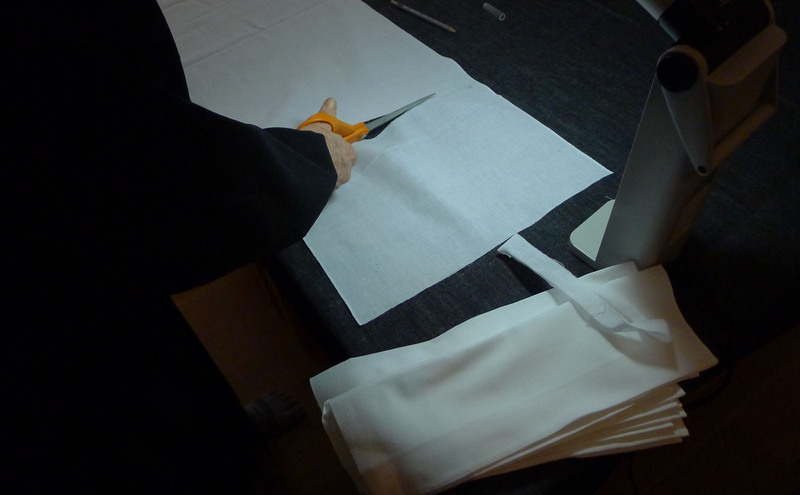 The sewing of the oryoki cloths. The first oryoki sets were assembled! 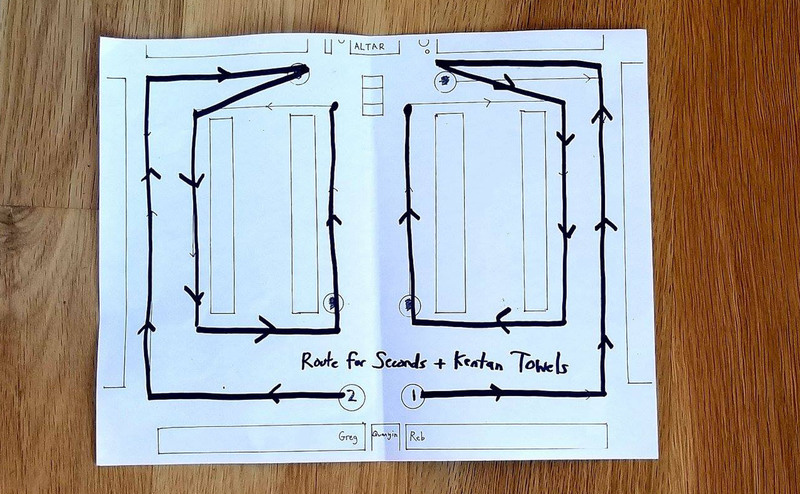 The plan for oryoki service in the zendo. An oryoki set: three bowls, a wooden spoon, a pair of chopsticks, and a setsu (a small spatula-like utensil used to clean the bowls). The outer cloth of the set is used as a place mat. An oryoki bowl set with the chants that participants sing during meal service.